The nationally recognized Sieben Polk Law Firm has dedicated itself solely to the needs of injured clients since 1953. We proudly represent our clients' interests throughout the Upper Midwest, including Minnesota, North Dakota and Wisconsin. Attorneys from across the country appreciate the work we do in this area of law. For that reason, they send their personal injury cases to us. These referring attorneys know that we understand the legal terrain of the Upper Midwest: its attorneys, its judges and its laws. But you do not have to wait to be referred to us. You can come directly to our firm to take advantage of the fact that our attorneys hold in excess of 200 years of combined legal experience. This experience means we offer clients the seasoned legal judgment specific to the Upper Midwest that many other firms simply cannot. 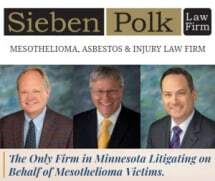 Sieben Polk Law Firm offers clients the best features of a large firm within a local firm environment. In doing so, we combine personalized legal services with the law firm resources that clients need when protecting their rights. You can schedule a free initial consultation with our firm directly by calling 651-304-6708 in Hastings. You can also contact our lawyers online. All communications between our firm and potential clients remain confidential.